I was trolling around for awhile looking for a solo canoe, but wasn't having much luck. Thankfully I stumbled on an end of season sale and found this baby! A tandem canoe is great when there are two people. When there aren't it's not so great... especially our boat, at 18 feet long! 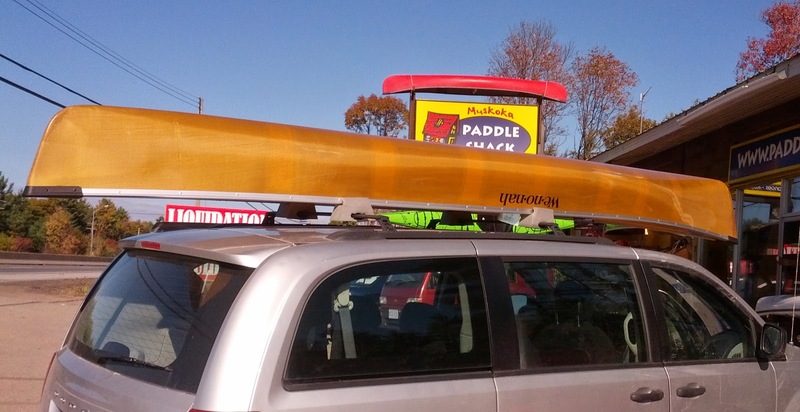 I thought briefly about a kayak, but I want to use this as training for my regular canoe activities, so really wanted to paddle canoe-style with as close of a set-up as possible. I looked at a few other options, but in the end I already own a Wehnonah, and this one ticked all the boxes. Just 32lbs, nice adjustable seat, foot brace. Price was right! I combed over reviews and everyone seemed quite happy with their Wilderness, at least the Kevlar version. When I hit the water I was grateful I didn't go any narrower (as I had been tempted to do). 30.5" is plenty narrow and it feels quite a bit tippier that our Jensen 18. I got used to it pretty quickly, though. It has a bit of rocker, and without the second person it wants to turn quite a lot, especially in wind. That will take some getting used to, and I definitely need to learn a proper "J" stroke! I was switching sides as often as every 3 strokes at times, especially into wind or current. I can't believe how light it is. I can throw the thing around so easily, pop it up on the roof, no problem. I ordered a yoke (regular wood one) to make a removable yoke out of for portaging and such. This boat had me grinning like an idiot - it was just so much fun. Very happy I bought it and can't wait to paddle it again!